It is with great sadness that we were told that Rocky Green, former Army helicopter pilot, CFI, President of the LRAA , EAA1541 member and friend to many in the aviation community has passed away shortly after being diagnosed with pancreatic cancer. Rocky’s funeral is set for Saturday October 6th at 13:00 at Lincoln Funeral Home, 406 H St. Lincoln Ca. A reception will be immediately following in the same building. The October Board of Directors meeting takes place on Wednesday 3rd. It will be at the House of Pizza, 2270 Nicolaus Rd., Lincoln… dinner at 18:00, meeting at 18:30. All members are invited. Audio Video: screen and speakers mounted; next? As a chapter we have the opportunity to receive a personalized tour of the Boeing 747 Global Super Tanker that is currently based at the McClellan Jet Center. One of the air tanker’s pilots has offered us this opportunity to get a close look at this huge air tanker, inside and out, used around the world to fight forest and range fires. We can take up to twelve people on the tour. The plan would be to meet at the McClellan Jet Center on Saturday, September 29 at 13:00 for about a 90 minute tour with one of the pilots. We’re looking for a firm commitment so check your schedules and respond if you can commit to participating. This needs to be one of those aged 10 and older things for the tour. We’ll take the first twelve responses but, again, please make sure you can go if you say you can. Car pooling opportunities abound and maybe a common lunch stop first, but we will figure that out after we have a list of attendees. We will also have a presentation by pilots of this tanker at our Saturday, October 13, BBQ Lunch. 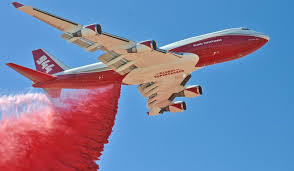 Because this is an operational air tanker, there is always the chance that it will be activated and/or dispatched out of the area prior to our tour, in which case the tour will be postponed or canceled. Our chapter’s next Young Eagles Rally will be held on Saturday, October 6th. We’re expecting 75 kids to fly, and currently have 7 pilots. Pilots, go here. Use the event code”1541″ to register. If you signed up for our prior event, the sign up process is very quick. This is a “private” event for pilot signup, thus the required code input. You will create an account with Flight Squid with your own password, which you will want to remember. You will need to have your EAA member number to complete the sign up process, and it will also ask you to enter aircraft information. You will only need to do this once. Presuming we have future Young Eagle events and you participate, then that information will be automatically be entered when you register for those events. If your plans change, it is a simple process for you to log in again and delete your registration for any event. If you have not yet completed the process to be a Young Eagles pilot (application to EAA HQ and complete brief training and background check) or you are out of date (more than three years since completion), then you’ll need to complete that process before signing up on Flight Squid. For those in a supervisory role at the Rally, complete the simple online Young Eagles training course and basic background check, both of which need to have been completed within the last three years. If you’d like to volunteer for any of these positions in a future event, please click here to email our Young Eagles Coordinator. Note that this is the same day as our Young Eagles event. It’s cool and clear and the Annual Sutter Buttes Regional Rag Wing RoundUp at O52 is just around the corner. They want to invite you, and your amazing gravity defeating aircraft if you have one, to join them on Saturday Oct 6, 2018 for their annual get together between 9 am to 2 pm. It’s a great time to bring pilots and planes together, have some good food with some good tunes and support aviation in our small communities. If you plan on attending they would appreciate if you could respond letting them know you will be joining them and if you have a rag wing, low wing, rocket ship, kite, SR71 or parachute, that you will be bringing with you to show off. There’s even a website for the event! Topic: California Capital Airshow FAASTeam Seminars. We’re having a hangar work party starting around 08:00 this Saturday, September 22nd. We’re aiming to do some insulation, building work and wiring. Come along and help out! Just a reminder that it’s the Capital City Airshow this weekend. On Wednesday evening, September 19, we will have our monthly member meeting with a BBQ Dinner starting at 18:00 also at our chapter hangar. Wear your name tag or get one at the door along with a door prize ticket. After a short business meeting, we’ll have a program about drones by Chris Reeder of the USAF.